Baths and nail trims are available separately. -Call our office for an appointment or for prices. Our groomer is available Monday-Thursday. 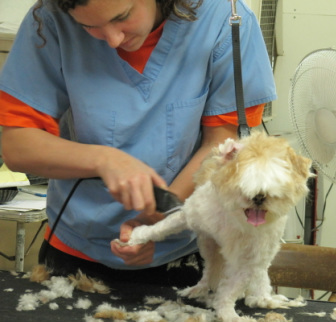 -Pets coming in for grooming are expected to be here between 8 and 9am. You will be called when he/she is ready to be picked up. -Dogs are required to be up-to-date on their DHLPP, Bordetella, and Rabies vaccinations. Cats are required to be up-to-date on their DPRC, Feline Leukemia, and Rabies vaccinations. If vaccinations are needed and the pet has had them before, we can update them at the clinic the day of their grooming.